Welcome to the 2nd quarter of 2019. This year is quickly passing whether you’re in the game or not. I’m a countdown kinda girl. I have a running countdown to several things. It’s 25 days until our BIG Life Chicago Mission Retreat. It’s 39 days until my daughters’ high school graduation. 87 days until we go white water rafting at the BIG Life Colorado Retreat, and just 99 days until my daughter leaves for the Army. I number my days because when each one is assigned a number, that means it counts. Think about it, when you’re teaching a child how to count and they say 1, 2, 3, 4, 6, 7 … you would say oppps, you missed one. Remember number 5. 1, 2, 3, 4, 5, 6, 7. That number 5 is important. It may not be your favorite number, but does that really matter? 5 is still important and you can’t just skip over it. Your days are numbered, whether you’re counting or not. And while you may not have woken up to your favorite day ever, this day is of tremendous importance. Don’t just skip over it. This is day #91 of 2019. Isn’t it crazy how fast these 91 days have flown by since we celebrated New Years? We are 1/4 of the way through this entire year. How many of those days have mattered? All of them. Every single day has mattered. But think back over the days so far this year, was there a particularly hard day in there? What has been the worst day of 2019 for you? A day when everything went wrong. A day when your world came crashing down. Now think about the best day of 2019 so far for you. What day was it that was near perfection for you? What day brought you tremendous joy? Now understand this, your worst day and your best day, as well as all the ordinary days in between have brought you to this day, #91. Have you been counting them? More importantly, have you MADE them count? Teach us God. Teach us. Help us to get this right. When is the last time you simply prayed, “God, help me to get this right.” Teach me how to live this day right God. I don’t want to waste this day. It’s important. I can’t just skip over today and expect to arrive to a better day tomorrow. Today is #91 and I can’t get to #92 without it. Help me get this day right. Your greatest gift is your time. The time God gives you is precious. How are you spending it? You will never, ever, ever in all of eternity get another shot at this day. 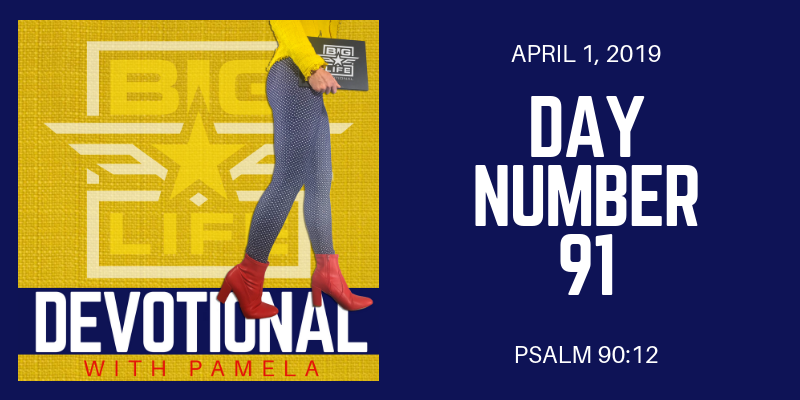 This number in your life will never come again, so don’t you think it’s important to consider how you will spend your time today? Would you give your money to just anyone? I mean would you mail 60 bucks to FaceBook? Think about it. Would you be comfortable with tucking three 20 dollar bills in an envelope and sending it in to Face Book? No. Well, then shouldn’t you consider giving it 60 minutes of your time? You can always make more money, but sister you can’t make more time. Would you leave a 5 dollar bill on the windshield of the jerk in the parking lot who took your parking place? Of course you wouldn’t. Then why would you give him 5 minutes of your day being upset over him? Don’t you understand 5 minutes of your LIFE is much more valuable that 5 dollars of your earnings? At the very end of this day, you will have spent 1,440 minutes on something. Will it be of value? Will you come to the end of this day even remembering what you did? Or will it be just another Monday that your survived and #91 is marked off the calendar as a day without return. Lord, teach us to number our days, that we may gain a heart of wisdom. Help us to do this right today. Help us to see our time as more valuable than our money. Help us to get smarter about this so we can live well. Who needs to confess over some wasted days and wasted nights. (Oh, that’s a song. Don’t let it be your song.) What a shame to blow all your hard earned money. What a bigger shame to squander your numbered days. When you number your days, you understand each one counts. When you’re counting down, you see the value of THIS day and the work that needs to be done. There’s a countdown on your life. How many more days do you have? Is it 100? Is it 500? Is it 5,000? You and I may not know the answer to that, but we know this for certain, yesterday is gone and that day will never come again. We either have something to show for it, or we don’t. And today will be the same. Today the countdown on your life continues. Today holds tremendous value. Today is 1,440 minutes which are more valuable than $1,440 dollars. Let us not waste a single buck. Who gets your time today? What gets your time today? Let’s be smart about this day of life. Let’s invest well. Let’s not miss a moment of it. Today counts. Make it count.